Then take a look at Konnekt Videophone for Grandma. Adult children often like to give “Gran” a computer tablet or a laptop as a present because they believe it will be useful and easy to use. It can be — for those with good vision and hearing, hand-eye coordination and the ability to learn new gadgets — for many years. A tablet or iPad for Grandma, Grandpa or an elderly relative can be very useful because it can entertain them, help them preserve their memory and functioning brains, and it can keep them connected with family and friends using a video calling app. The Konnekt Videophone is an incredibly simple appliance, much easier than a multi-functional tablet or an iPad for Gran to use. Videophone is a dedicated device, designed specifically to give older adults a better quality of life. They can see family and friends as often as they like, without the travel. Live independently but still be part of the family. Watch their grandkids grow. Talk face-to-face to their loved ones as often as they want, and bring a smile to those too far away to visit. In a recent survey of older adults, over 80% of seniors said that they are willing to try video calling. Konnekt makes video conferencing practical – and simple – for seniors. Videophone users tell us that they love it much more than a regular phone. It’s like having the family and friends on TV, with one “channel button” for each relative! You and your kids probably already have a mobile phone, an iPad or tablet, or a computer. You can use any of those devices to talk to Gran on her Videophone, face-to-face. And when you call Gran, she’ll instantly see your name in BIG letters. She just touches the huge ANSWER button, and she’ll see and talk to you as if you’re both in the same room. Moreover, she can talk to her older relatives and friends around the world on their landline telephones, too, with just one touch. Konnekt does EVERYTHING: Setup, personalization, delivery, support… we can even do installation and Internet in Australia (but don’t worry, you or your favourite nephew can easily get it started for Gran). We also help your Contacts get going on Skype, with high-quality video calls. Call us for help or to make changes remotely. We personalize buttons and messages, in any language, and customize ringing durations so that Gran can take as long as she wants to answer. Selection Guide: iPad vs Videophone? 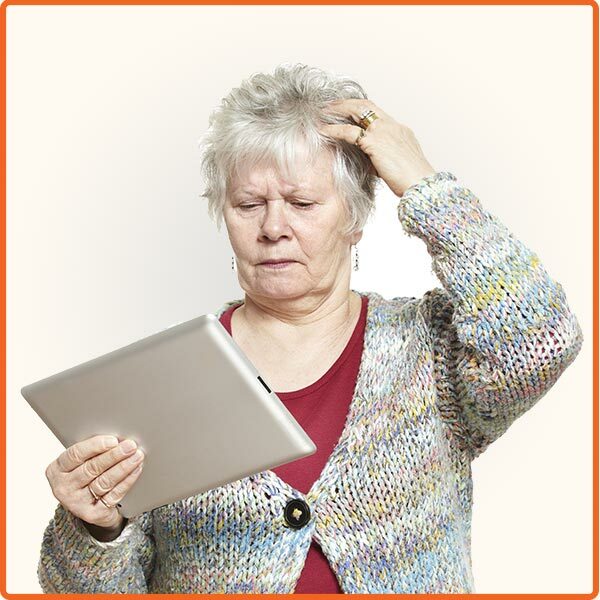 Most seniors tend to have problems using a regular tablet computer, even if it is simplified, because of the menu and the number of options. This can be scary and intimidating for Gran and frustrating for you. Read how the Konnekt Founders solved the problem or learn more about Videophone. LOUD, clear sound from two large speakers. Much louder than a tablet or PC. Extra LOUD ringtone available. Hear it ring across the home. LARGE 15-inch (38 cm) screen, ideal for poor vision. Much bigger than a tablet. HUGE (15 cm) one-touch Call buttons. Awarded for ease-of-use by seniors. Blocks unknown callers. No telemarketers or fraudsters! No numbers to remember. Each Call button first dials the Contact face-to-face, then dials backup landlines. We do everything… even help family and friends get onto Skype, and make all changes for you, remotely. Auto-answer for trusted carers. Look-in when there’s no answer, or in emergencies.